Using Reports in Web Help Desk, you can build real-time reports on multiple assets based on the features you choose. Asset reporting can help you better manage organizational assets by providing the statistics you need to make informed decisions. In the Reports screen, click New. In the Report Name field, enter a name that identifies the report. This name will appear in the report title. If no Report Groups are available, the default report group is Sample Reports. To create a new report group, save the information currently in the Report Basics tab and see Create report groups to learn how to build report groups. To apply the newly-created Report Group to a report, select the report from the list of Web Help Desk reports, click Edit, and select the Report Group. Click the Report Type drop-down menu and select Asset Report. In the Chart Type row, ensure that Bar Chart is selected. Click the Bar Category drop-down menu and select an option. For example, if you select Model, the bar chart will include all assets by model. Click the Bar Stack Category drop-down menu and select Asset Type to specify the data stacked on each bar. (Optional) To draw the bar stack categories with percentage values, select the Draw as percentages check box. Select the Report Filters tab. Click the Filter Attribute drop-down window and select an option. For example, if you select Model, the report filters all assets by model. In the Report Details window, click Save. Click Run Report to generate the report. The report displays, as shown in the following illustration. Click the Pie Slice Category drop-down menu and select an option to indicate which data the pie slices represent. 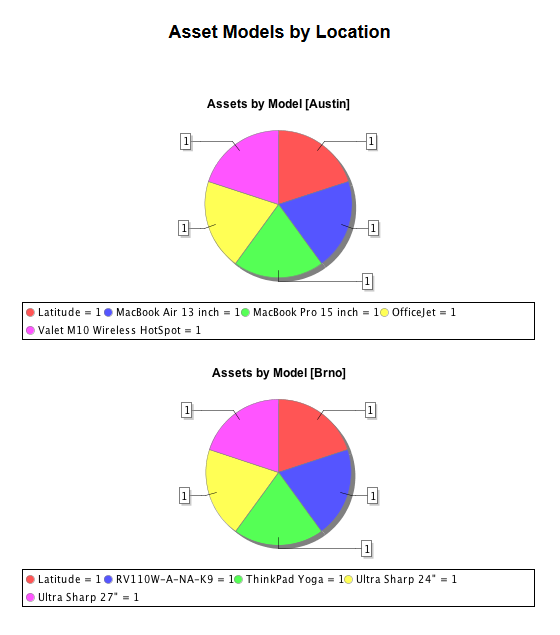 For example, if you select Model, the pie slices in the report will represent assets by model. 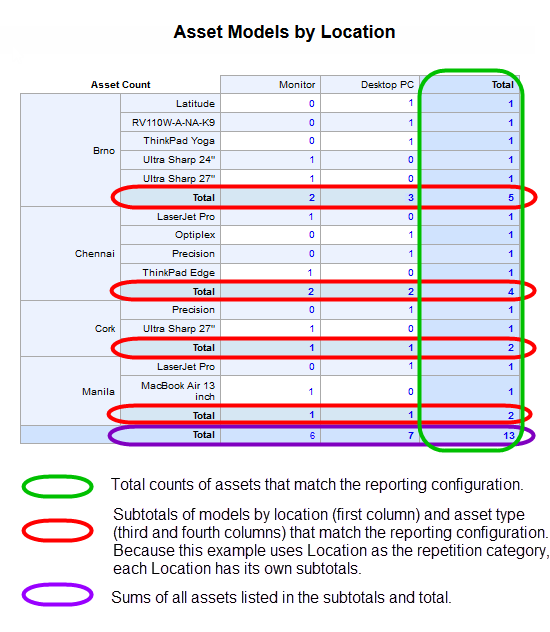 For each category, select how many asset types and locations to show in the chart. Pie charts default to show the top 10 items, unless you specify another number. For the best illustration, keep the number of items shown in the pie chart to 15 items or less. If you need to add more than 15 items to a pie chart, consider using a bar chart instead. To include a table in the report, select the number of items to include in the table. The default amount of items shown in tables is 100. Report filters restrict the tickets included in the report by specifying the attribute values that should be excluded. For example, a Status Type filter could restrict the report to Open or Pending status types. Click the Help icon in the Report Filters tab for more information. If your filter attribute is identical to the report category, only the values allowed by the filter appear in the report. Click the Row Category drop-down menu and select Model to indicate which data appear in the table rows. Click the Column Category drop-down menu and select an option. 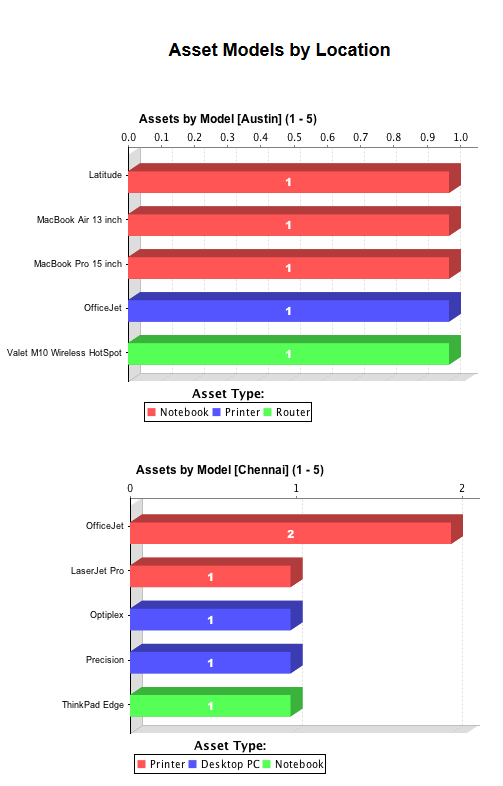 For example, if you select Asset Type, the table columns in the report will represent assets by model.